I took this pic a couple months ago around 4:45 p.m. one afternoon. 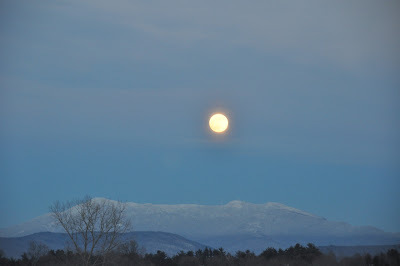 I was driving home, and about 1.5 miles from my house, right outside our neighborhood, this is what I saw -- the moon rising over Mount Mansfield (aka "Stowe" for non-Vermonters). I don't really feel the need to write 200 words about this. It was just one of those great reminders of how much I like where I live. Wow, 4:45? Very boreal. Great picture. Since the time I came to visit you guys with my folks, I've often said if I were to live anywhere else besides Northern Michigan, it would be VT. I loved it there, too! Nice pic!